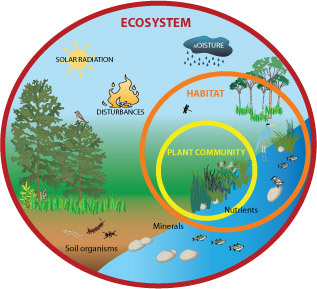 Figure 7.1: The graphic above illustrates how plants and plant communities fit into broader ecosystems by providing habitat, preventing erosion, and affecting water and nutrient cycling. Plant n. 1, a living organism, lacking voluntary motion, usually rooted in and growing from the soil. Plants compete with each other for space, light, nutrients, and water. Sometimes they support each other, too. They play key roles in water and nutrient cycling. They provide habitat for other organisms. They prevent soil erosion. For people, plants provide food, fiber, construction materials, aesthetic benefits, medicines, pesticides, fragrances and more. For example, a study reported by the National Arbor Day Foundation stated that increased tree cover in urban settings was correlated with lower crime rates, and there is evidence that vegetated “green” areas provide strong stress reduction and psychological benefits, including reduced severity of symptoms associated with Attention Deficit/Hyperactivity Disorder, or ADHD (as documented by Richard Louv in the book Last Child in the Woods). Plants and animals evolve together. For example, plants continually develop ways to attract pollinators, usually by providing a resource for them, while pollinators continually adapt to gain better access to those resources. 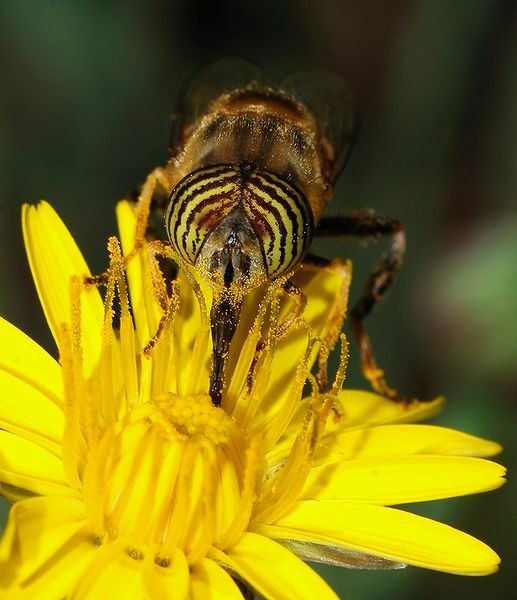 Figure 7.2: A syrphid fly (Eristalinus taeniops) pollinating a Common Hawkweed. Many plants allocate energy to producing an attractive fruit so that seeds are dispersed as widely as possible by animals, and those animals develop methods for finding those fruits. Several species of insects even live out part of their life cycles within plant tissues (e.g. leaf miners, budworms, bark beetles, etc). 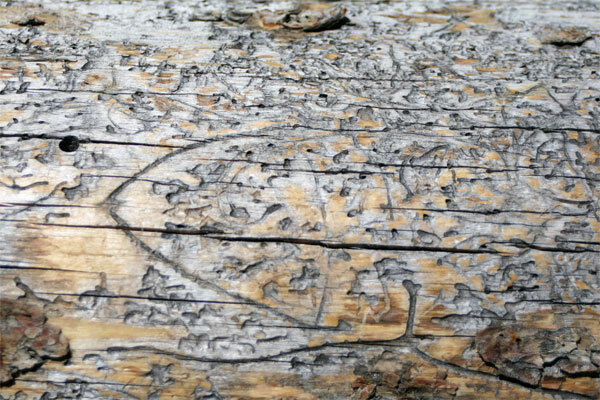 Figure 7.3: Mountain pine beetles, a kind of bark beetle, spend much of their life cycle in plant tissue. They kill trees by boring through the bark into the phloem (defined later in the module) layer on which they feed and in which eggs are laid. “Tracks” like those shown in the dead tree pictured at the top are left by the feeding larvae. 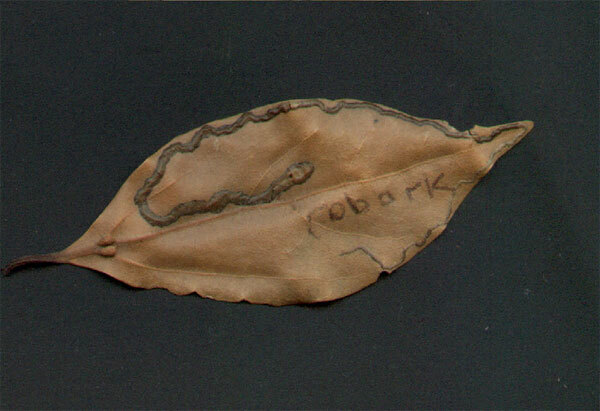 Leaf miners are larvae of some insect species that live in and eat the leaf tissue of plants. The trail on the leaf above was made by a leaf miner. Note the initial thin width of the insect trail, becoming wider as the insect grows while it navigates around the leaf. Through this dynamic process of co-evolution, angiosperms (or flowering plants) have evolved explosively over the past 150 million years to encompass approximately 250,000 species worldwide. This is almost 20 percent of the total number of known organisms on the planet (Wilson 2000).